A new look for the service that started it all. Many moons ago we started on this project, however you are now looking at the spanking new PagelyÂ® branding and website. We made a few branding and stylistic tweaks along the way in our five years of managing WordPress, but this is the first top to bottom rebrand. Have a look around and please tell us what you think. The logo for one. We spent some time working through a few hundred concepts for a new mark. When we came up with this stylized P and new font combo we were sold. In our opinion, they are clean and bold, yet still approachable. See all the mark variations. A network: The lines/strokes are like network or routing paths. Scaling; The outer P is larger than the inner P denoting how our Amazon stack can scale. Security: The outer is protecting the inner with a single gated access point. New Colors. We chose a modern palette of a blue’s and grays that stay close to our roots, but added a splash of orange to add some color and excitement. Again the orange speaks to our Amazon powered stack as well. An all new flat responsive design. We started with _ underscores and added bootstrap 3 and then went to work building the site to be mobile and desktop friendly. All new copy and positioning. We will of course find a few more typos buried in here however we crafted to copy all around to support our up market positioning. 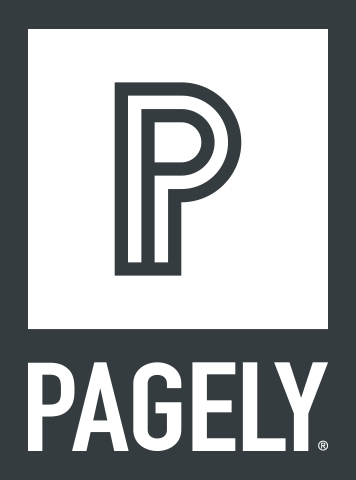 Pagely has and always will support all types of WordPress powered sites. That being said we are focusing more of our efforts on our VPS and Enterprise tiers that have been hugely successful. The old blog at, blog.pagely.com is no more, as everything has been moved under pagely.com/blog. We felt like it made sense to keep all this great content under our primary domain. Overall we tried to make a site that was clean, conveyed our main value points, but stayed true to our relaxed culture by using a lot of retro or older photos through out. WordPress is a big community with many smart and interesting people doing amazing things. Over the summer as we were rolling out our new VPS plans we were approached by a handful of community notables wishing to know more about what we were up to. We obliged, and as one began using our service and fell in love, others followed suit. We therefore created a brand ambassador program where Pagely and these individuals work together in a co-marketing and thinktank style arrangement. Full Disclosure: They are paying clients, however they do receive a handsome discount as part of the program. We are launching today with 5 ambassadors and have several more queued up. Pagely is, without a doubt, the best hosting experience I’ve had in the last 5 years. They have allowed me to focus on building my products and services while not worrying about how my site is performing. It has been an exciting 5 years for us. We love our investors and the many friends that have helped us over the years. We look forward to starting this new chapter as we take Managed WordPress into the future. sleek and professional overall, and the new logo is sweet!